Today in Masonic History William Ruffin Cox passes away in 1919. William Ruffin Cox was an American politician and Confederate soldier. Cox was born on March 11th, 1832 in Scotland Neck, Halifax County, North Carolina. At the age of four his father passed away and his mother moved the family to Tennessee. In Tennessee Cox received his education and attended Franklin College where he graduated before attending Lebanon Law School. After passing his bar exams, Cox opened a private practice in Nashville. His practice flourished there before, in 1857, he married and moved back to North Carolina and purchased a plantation. In 1859, he moved to Raleigh where he entered politics. He attempted to gain a seat in the North Carolina legislature and was narrowly defeated by a mere 13 votes. In 1861 when North Carolina seceded at the start of the American Civil War, Cox raised and outfitted the Ellis Artillery Company. Shortly after he raised an infantry and was made a major in the 2nd North Carolina. He fought with the 2nd North Carolina at the Battle of Antietam. There he was promoted to Lieutenant Colonel. The colonel of his regiment was killed in battle, and the new colonel resigned and Cox was promote to Colonel. Due to injuries Cox received at the Battle of Chancellorsville, he missed the Gettysburg Campaign. During the battles of the Wilderness and Spotsylvania Court House he was personally commended for his efforts on the battlefield by General Robert E. Lee. Cox was promoted to brigadier general in the final year of the war and led his division during the Appomattox Campaign. He surrendered his men to Federal forces at the Appomattox Court House in April of 1865. During the course the war, Cox was wounded eleven times. After the war, Cox returned to North Carolina and to private practice. 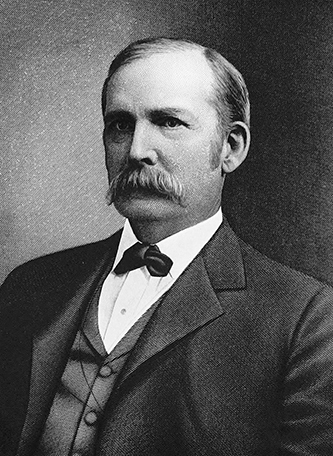 He was chairman of the North Carolina Democratic Party from 1874 to 1877. In 1877 he was appointed as a Superior Court Judge. He resigned as a judge in 1880 when he was elected to the United States House of Representatives. That same year his wife passed away. He served in the House of Representatives until 1886 when he was not nominated for reelection because he had gone against party leadership by campaigning for civil service reform. Cox remarried and retired to his plantation. In 1893 he was appointed as Secretary of the United States Senate and served until the turn of the century when he retired permanently to his plantation. Cox passed away in December 26th, 1919. Cox was a member of William G. Hill Lodge No. 218 in Raleigh, North Carolina.